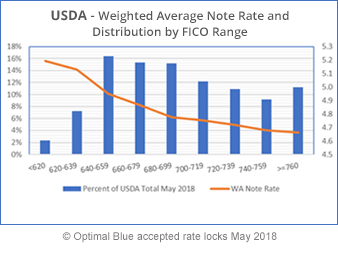 How Does a Credit Score Impact Loan Payments? 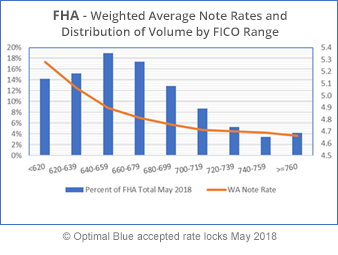 We all know that a borrower with a higher FICO score will get a better rate on their mortgage, but how much better? Consumers are always asking this question so we thought we would share our findings. The answer depends on the type of mortgage they are receiving. Let me illustrate with a couple of examples on various loan types. 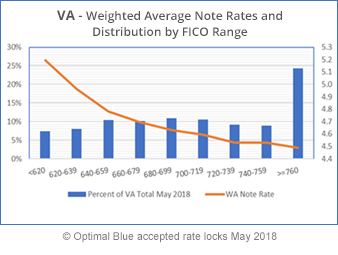 In May 2018, Optimal Blue data shows that borrowers of government (FHA, USDA, VA) or conforming loans with a FICO score below 640 were getting rates that hit between .50 and .70 higher than borrowers with FICO scores over 760. On a $300,000 loan, that translates into a payment of about $100/month higher for the borrower with a low FICO. 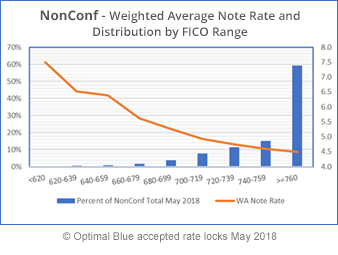 However, for jumbos (non-conforming), the difference in rate between a 640 FICO borrower and a >760 FICO borrower is a whopping 3 points! On an $800,000 loan, that’s a difference of $1,500 more per month on their mortgage payment. 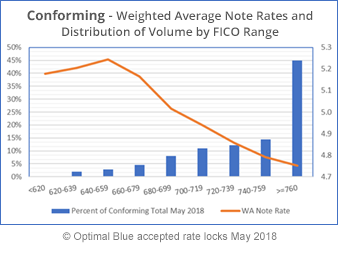 Optimal Blue's data and research proves that it pays to maintain a good FICO score, so all mortgage borrowers should be aware of their credit standing! If you have borrowers that could use a few tips on how to increase their score, we recommend checking out How to Repair Credit & Improve FICO Scores.